Juliette Ozols has been a resident of Nevada since 1976 and grew up in beautiful Pahrump, NV. 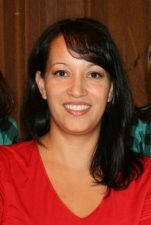 Juliette holds a bachelor’s degree in Psychology and is currently enrolled in the Executive MBA program at UNLV. Juliette is the President of FasterCable, a 25-year-old national distributor of low voltage and industrial cables & connectors. FasterCable is also a certified minority owned business. Juliette’s volunteer career includes serving on the NAWBO Southern Nevada’s board as treasurer for two years and as finance chair for 1 year. She also served as treasurer for the Nevada Women’s Lacrosse Association (NWLA) for two years and helped merge the league with the boys to create a more efficient SNLA (Southern Nevada Lacrosse Association). She currently joined the board of S.H.E.R.O. Foundation to serve as treasurer as well as to support young girls and women under the age of 25 who have been abused, abandoned, neglected, and exploited. Juliette and her husband, Richard, are the proud parents of two teenage girls one of whom is on her way to the University of Alabama. They enjoy traveling, wine tasting & entertaining. Superpowers: superhuman strength, endurance, and flight!